Mauritius - the island of incomparable beauty situated in the Indian Ocean is home to some of the world's most breathtaking coral reefs and marine life ever to be seen. Full with hundreds of bright-colored fish, the underwater world of Mauritius can be deemed a natural wonder. When you dive in Mauritius you enter the world of the underwater wonders and explore coral reefs, multi-colored marine life, ship wrecks dating back to the 18th and 19th centuries, as well as some ships sunk more recently which created beautiful artificial reefs. Unlike the reefs in Seychelles and the Maldives, the coral reefs in Mauritius have not been bleached or affected by the warming of the ocean. The crystal clear water, the abundance of fish life and colorful reefs provide magnificent backdrops for underwater filming and photography. Mauritius, almost completely encircled by a barrier coral reef, is home to many sponges, sea anemones and a variety of multi-colored fish such as the Damselfis, Trumpet, Boxfish not forgetting the playful clown, as well as Mauritian scorpion with its unique orange color. These wonderful colorful creatures and decorative vegetation provide a magnificent show for all divers. During the last century, artificial reefs have been created by sinking wrecks. These wrecks, usually old Japanese fishing ships, host an abundance of fish and coral life, offering you the diver to see amazing dive sites and interesting backdrops for underwater sights. 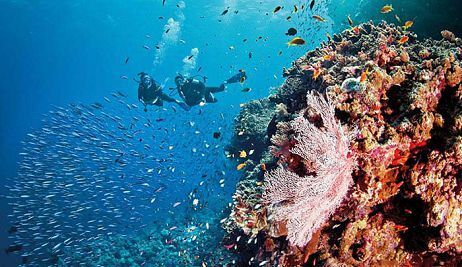 Discover variety of diving packages, diving courses and dive safari expeditions offered in Mauritius. Both beginners and certified divers can be sure to enjoy various diving activities in these perfect conditions. Book your preferred diving activity online and benefit from lowest rates, secured online booking facilities, immediate confirmation and personal dedicated service. Looking for a Diving Course in Mauritius? With Mauritius Attractions you can learn to dive in safe and controlled conditions under the direct supervision of the most qualified PADI instructors in Mauritius. You can chose from our basic '1 day - PADI Initiation diving courses' to our complete diving certificate programs (3 - 5 days). All year round Mauritius is a very safe and interesting location for a diving holiday. 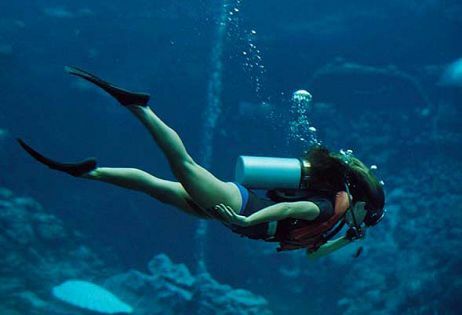 Even though Mauritius is an evergreen scuba diving destination, the months of summer (November to March) are considered to be the best time for Diving. During the summer season, the warm water attracts an abundance of fish and marine life. People going for diving during this particular period can easily catch sight of extremely exotic fish, such as the parrot fish, groupers, wrasses, sweetlips, angelfish, sergeant majors, trumpet and clown fish, moray eels, crayfish along with a wide variety of corals, sponges and sea anemones. The huge selection of Dive sites in Mauritius offers an unforgettable experience for everyone - observing colorful tropical fish, searching for rare fish species, exploring spectacular caves and much more. Scuba divers in Mauritius are spoilt for choice of dive sites. There are numerous dive sites strewn all over the island. Beginners can start at the shallow side of the ocean, whereas experienced divers can head straight for the more adventurous dive sites such as cliffs, caverns, reefs, pinnacles and wrecks. One of the most well-known and popular dive sites in Mauritius is the Cathedral, which is located off the Flic en Flac on the western coast of Mauritius. Other famous dive sites in Mauritius include the Whale Rock, the submerged crater near Ile Ronde and the Roche Zozo that is an underwater rock pinnacle. There are about 30 famous dive sites in Mauritius, all up to depth of 40 meters – wide selection for everyone to choose from!